Heavenly bamboo. Narrow graceful shrub with bamboo-like look and bright red fruit. Napoleons Hat. Esteemed for the exquisite, vividly colored, saucer shaped flowers that grow from leaf axils, or directly from trunk and stem. They are mostly grown as greenhouse specimens by collectors, but can be used as landscaping ornamentals where conditions are suited. The reniform, reddish seeds of this species constitute a false kola, which has a taste closely resembling that of true kola. The flowers are fragrant and smell like Butterscotch! Moujean Tea, Bahamas Berry, Pineapple Verbena. 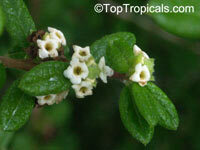 Evergreen shrub, native to the island of Inagua in the Bahamas. It is often used as a bonsai plant due to its miniaturized features. Tiny white flowers are borne in clusters in summer. It prefers full sun, warmth and high humidity. Wants to be consistently moist to wet and never, never dry. If grown indoors it will appreciate warm feet during winter (try a heat mat). A decoction of the fragrant leaves, variously described as having the scent and flavor of citrus, vanilla, or pineapple, is used as an herbal tea. A good choice for a small topiary or bonsai. Neea, Saltwood, Pigeon Plum, Hoja de Salat. 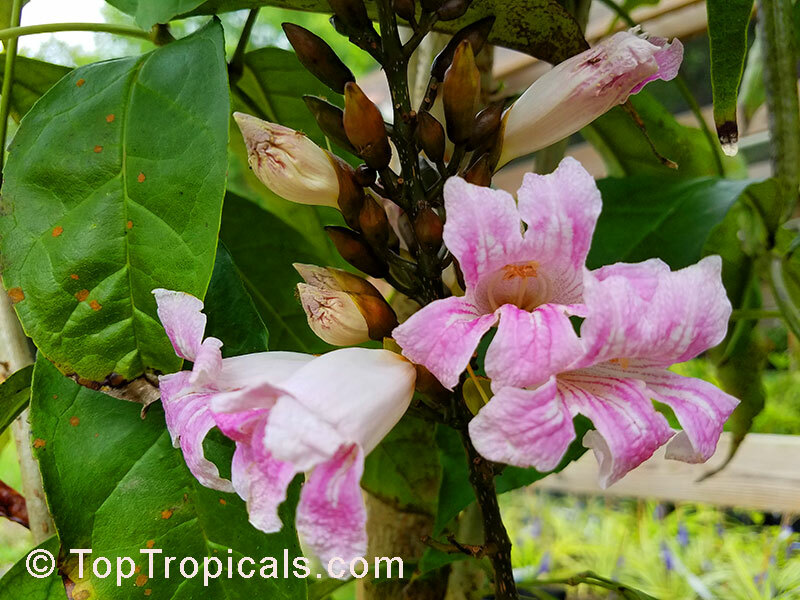 Rare in cultivation, this small tree or bush should get more attention from tropical plant collectors.The plant is very nice, easy growing and make those "jelly beans" like berries at least twice/year. The flowers are almost unnoticeable. The berries are very showy and come right after. It fruits for several months non stop. Mature fruit is edible. In its native countries, this plant is widely used medicinally. From book "Messages from the Gods. 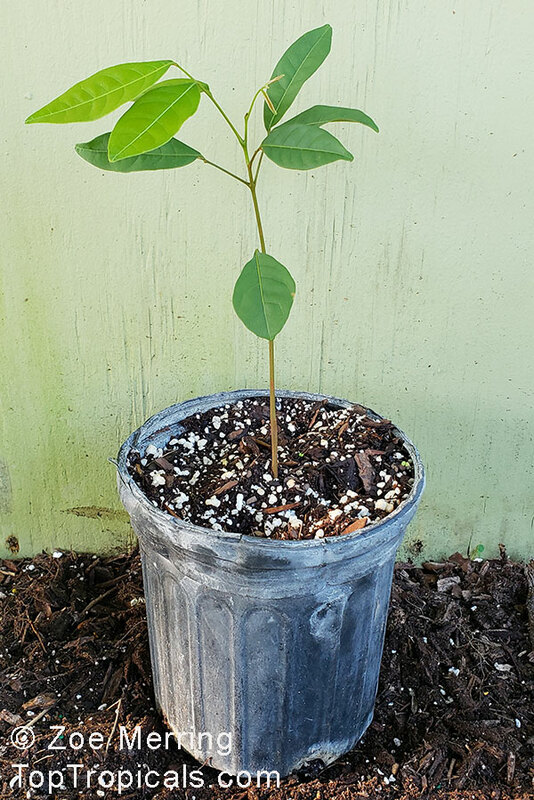 A Guide to the useful plants of Belize": "To treat babies who can not sleep, often accompanied with crying, especially when they have been frightened by chickens..." Very useful plant especially for those who are afraid of chickens! Lotus. 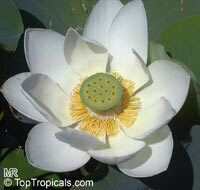 An aquatic perennial, originally from Indonesia and India. The big circular leaves are floating at the surface and the flowers above it. These flowers open early in the morning and can be 9 inches across. Nematanthus (Goldfish Plant) is a genus of flowering plants of the family Gesneriaceae. 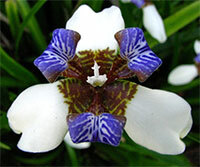 All of its species are endemic to Brazil. 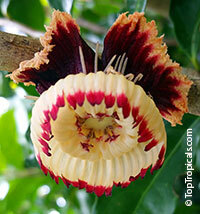 The plant is generally an epiphyte in nature and a hanging-basket plant in cultivation. 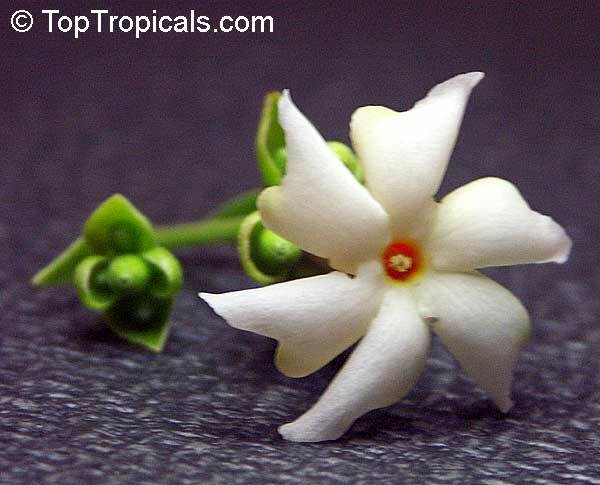 The plant has hundreds of thick, shiny, dark green leaves and colorful flowers that resemble tiny goldfish. 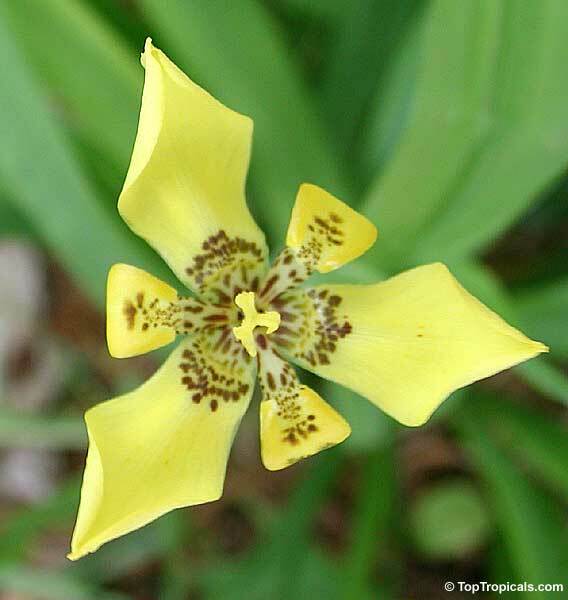 The flowers on a Nematanthus may be red, orange, or yellow. 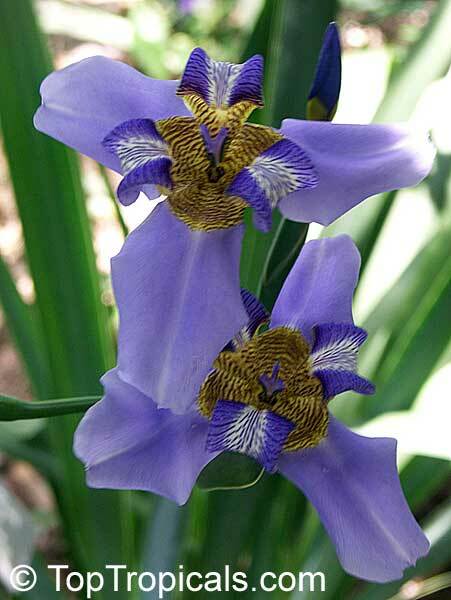 The variety Bijou has extremely ornamental leaves with bright mauve underneath. Plants are easy to care for, drought resistant, and, with proper care, can bloom all year. 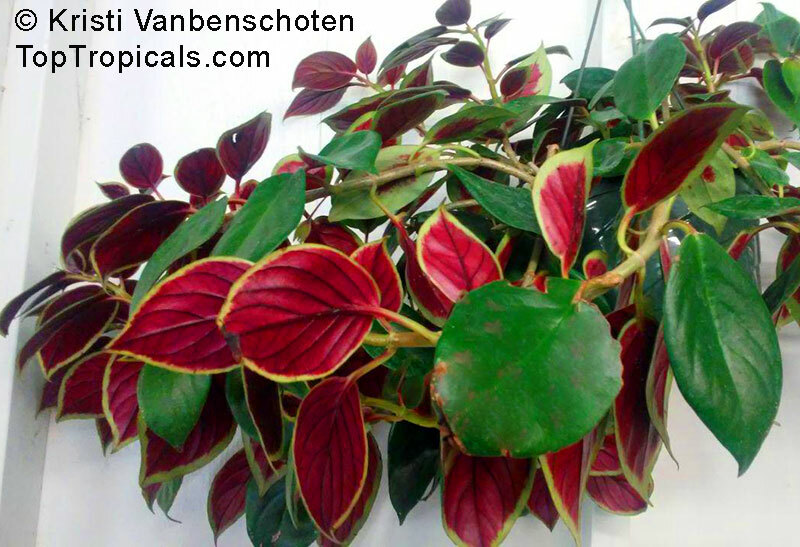 Tolerates filtered light, perfect houseplant! Pitcher plant does well in both cooler or warmer conditions. 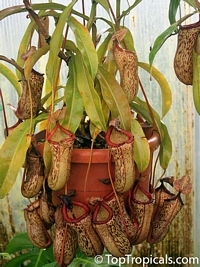 Tubby pitchers may be constricted at the waist, pale green to red-infused, while the stems are compact. Passive pitfall traps produced at the tips of the leaves trap and digest small insects. Color of the pitchers light-green, often with light or dark-red or violet spots. 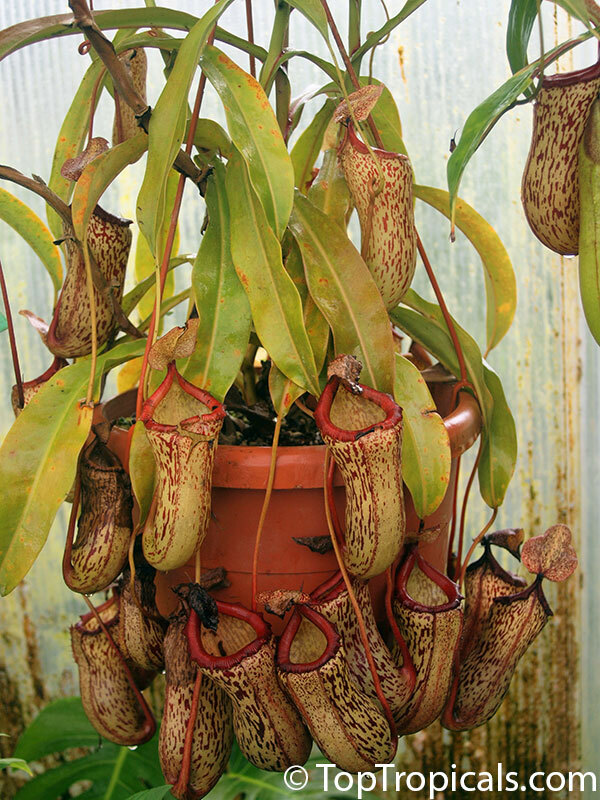 Nepenthes are extremely versatile and adaptable to many different growing conditions. The number one choice to try on a windowsill or tank, very easy, vigorous and attractive. Do not fertilize this plant! It gets all its food from "eating" insects! Rambutan - ruby red and covered with fine green-tipped hairs, the Rambutan is one of the most attractive fruits and also one of the most delicious when eaten at the peak. It is one of the rarest plants in tropical fruit tree collections. 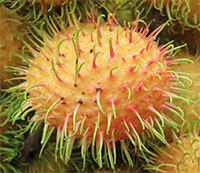 Rambutan is a type of fruit which looks much akin to the lychee with a sweet/sour flavor. 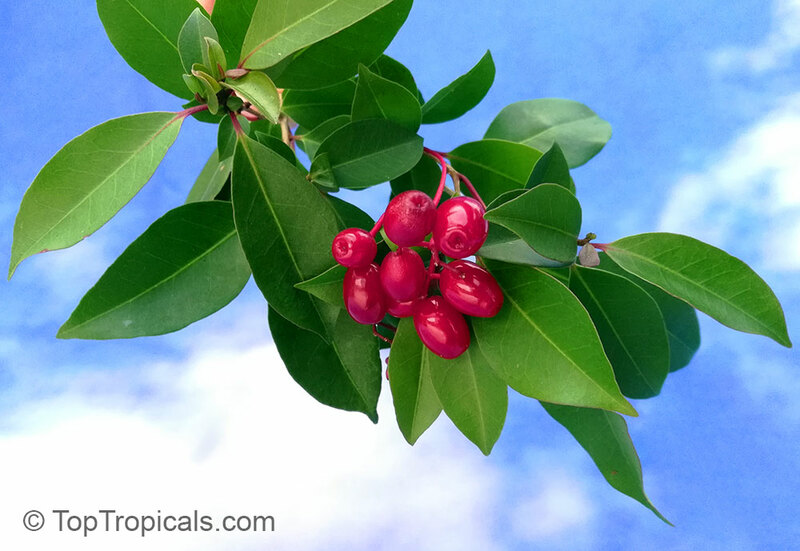 It is high in iron, vitamin C, copper and antioxidants and while it may be rarely found in your neck of the woods, it is highly prized in Malaysia, Thailand, Burma, and Sri Lanka and into India as well as eastward through Vietnam, the Phillippines and Indonesia. 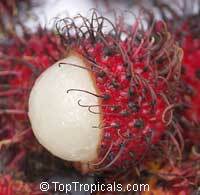 The name rambutan is derived from the Malay word rambut, which means hairy. Rambutan fruit is indeed hairy in appearance. The outer peel is red and covered with malleable, fleshy spines. The interior flesh is white to pale pink with a flavor similar to grapes. Rambutan trees like to stay moist. 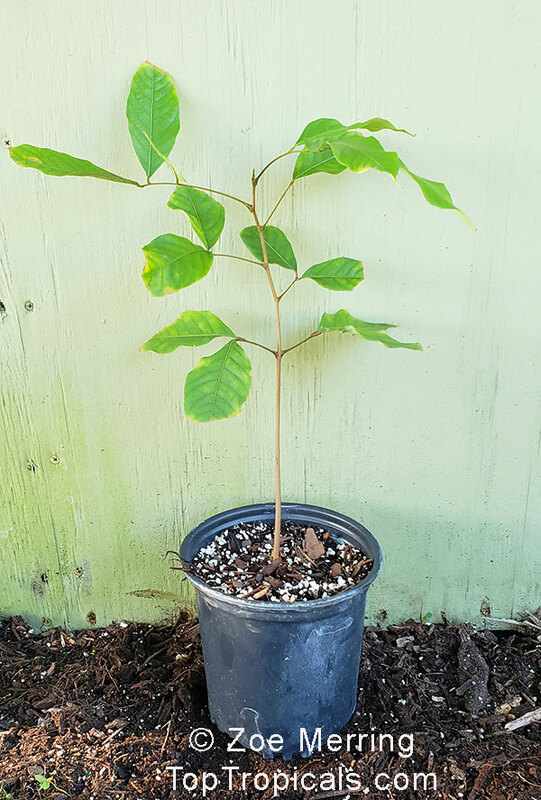 They thrive in temps from 71-86 degrees F. In fact, temperature and the proper humidity are the keys to growing a thriving rambutan. Yellow Rambutan - covered with fine green-tipped hairs, the rambutan is one of the most attractive fruits and also one of the most delicious when eaten at the peak. This rare variety has yellow fruit. The outer peel is orange or yellow and covered with malleable, fleshy spines. The interior flesh is white to pale pink with a flavor similar to grapes. Pulasan, Bulala, Ngoh-khonsan, Ramboutan-ake. 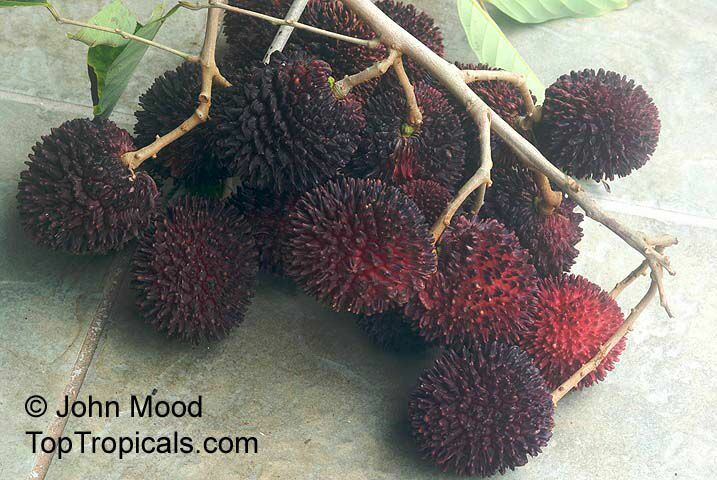 The Pulasan, or Poolasan is closely allied to the Rambutan and sometimes confused with it. The fruit is round to ovoid, about 2-3 inches (5-7.5 cm) in length, with a bumpy red, purple or yellow peel. The pulp is white or yellowish, translucent, juicy, sweet and aromatic. Delicious fruit, sweeter than the rambutan and lychee, but very rare outside of southeast Asia. 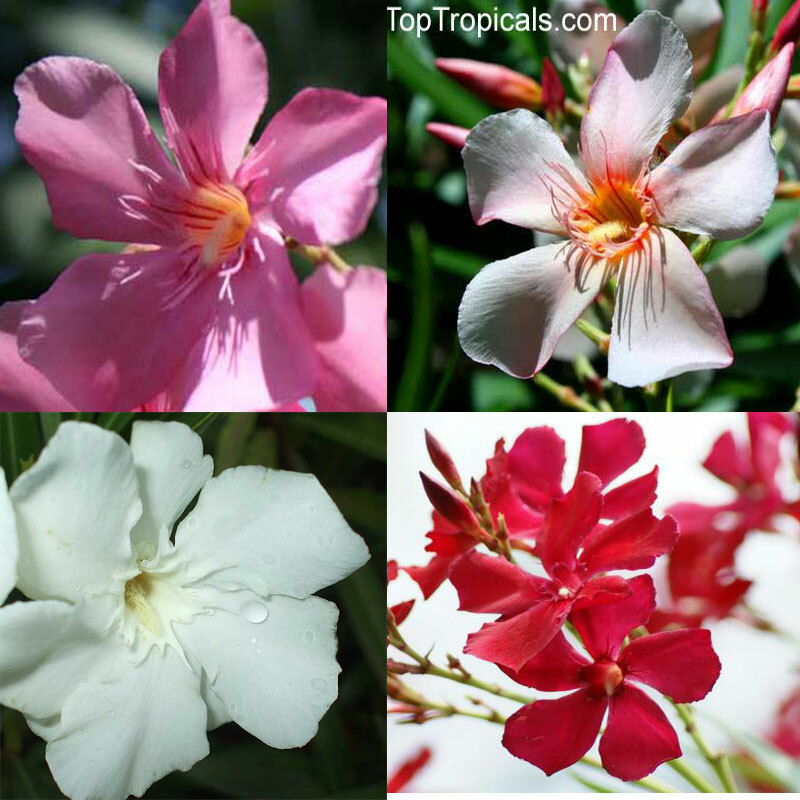 An ultra-tropical species, needing lots of water for much of the year, and a humid climate. 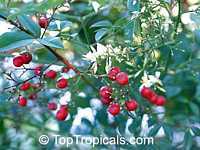 This is a tall, erect shrub with stiff, lance-shaped leaves and frequent clusters of white to pink flowers. 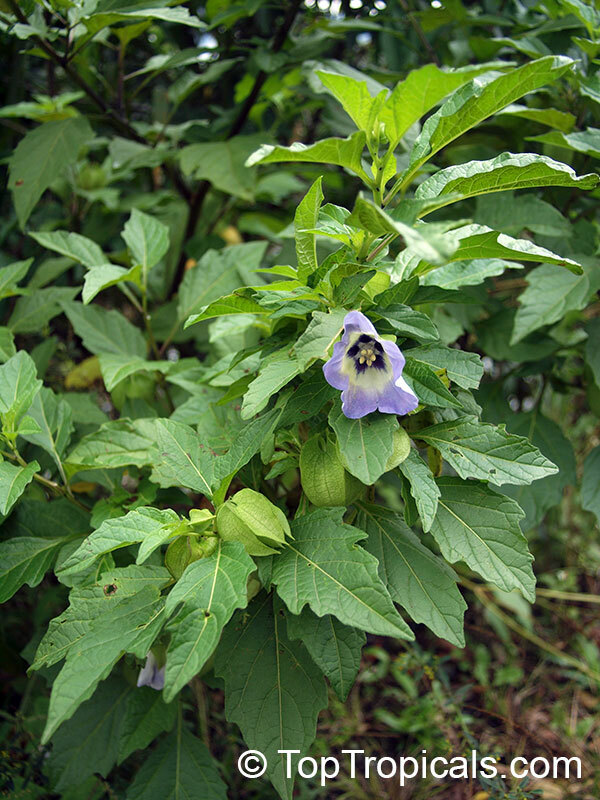 Shoo-Fly Plant, Apple of Peru. The plants are adorned with solitary violet bell-shaped flowers with white centers. It is the only species in the genus Nicandra. They are known for their property of repelling insects. 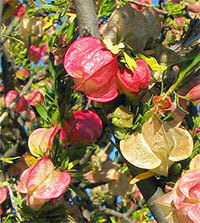 Flowers are followed by flat roundish capsules that split in half when dry. Each half of the capsule contains one seed. Propagation is easier by seeds as cuttings are very hard to root. 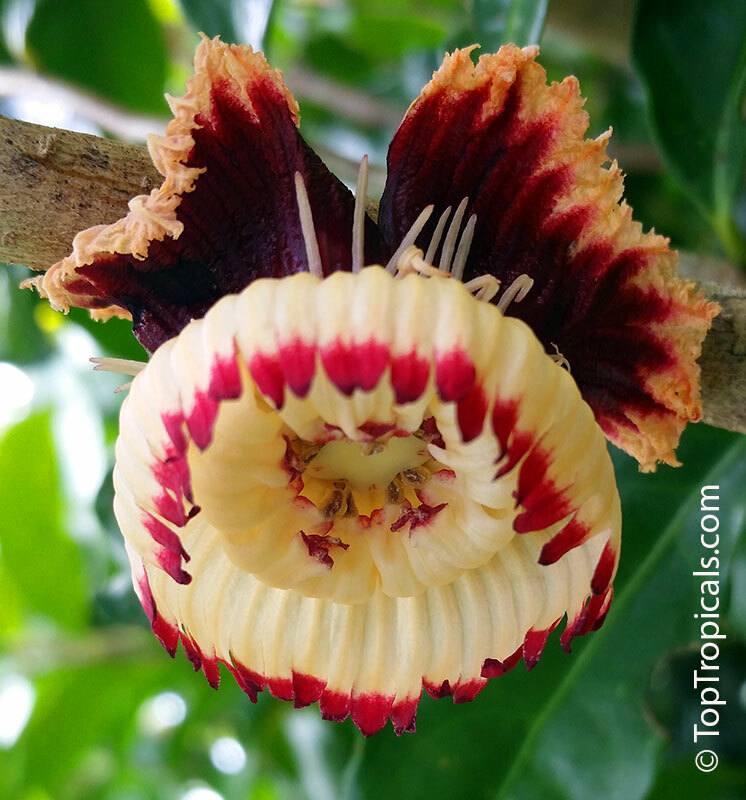 Nymania capensis is known in English as "Chinese Lantern" because of the shape of its bright, colorful fruit, and in Afrikaans as "klapper" (meaning "firecracker" because children sometimes pop the capsules for fun). 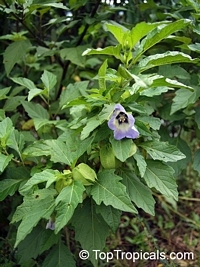 The plant has been reported to have been used in folk medicine.